Who Wants the Farm… and When? Farming dads need to transfer control and ownership (eventually) to younger farmers. If there is no successor, then what ? If there is a keen successor… congratulations! What do young farmers want? They want certainty of ownership, and a plan with deadlines. They want the farm intact. What do older founding farmers want? To be useful and appreciated. Fairness. They want an income stream for their lifestyle needs. Define timelines for the process. This is not Roundup®! Know the next steps that you need to take now! Assess what is fair DNA pay and sweat equity compensation. Elaine delivers actionable information farm business owners and managers can implement today. People seek out advisors after she hits home with her message. She challenges farm family businesses to get “unstuck” and not accept the high anxiety and stress of poor decision making. Her tools are grounded in years of working with farm succession planning and coaching. She’s survived two succession plans and can talk about it. 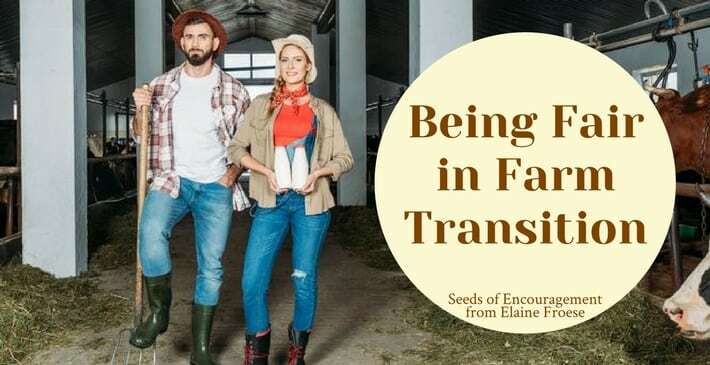 Elaine's a farmer and speaks to the heart of farm family issues. Her stories make people feel like she’s literally been at their kitchen table for years! Elaine's warm and charismatic personality afforded her great success in getting some of these producers into a productive mindset that can get them prepared to face and adapt to the inevitable evolution of the BC cattle industry... Elaine’s presentation style is professional and authoritative, yet gives a person the feeling that they are talking to a friend and confidante who has their best interests in mind. It’s her genuine concern for the happiness of her clients that makes her so successful in helping agriculture families. You captured the audience’s attention from beginning to end by being truthful about the topic and using real life examples. The presentation was done in a way that everyone in the audience could relate to in some way shape or form. I have attended many seminars and conferences over the years and your presentation had the biggest impact on the attendees that I have ever experienced. Hire Elaine Froese to help your audience understand and overcome barriers to farm succession planning.